Try telling the 100 people packed into Geno’s Traditional Food and Ales at 8 a.m. on a Sunday that Spokane isn’t a soccer town. To the warm and inviting scent of eggs and coffee, a throng of barkeepers, waiters and waitresses slicing through the thick crowd, fans of Earth’s most popular sport drank, cheered and jeered as France and Croatia battled it out for 90 minutes to take home the coveted World Cup. 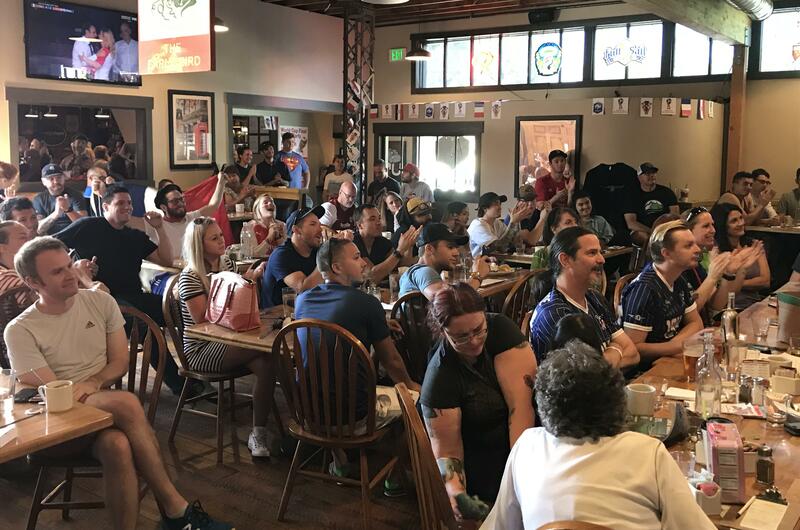 Organized by the Spokane chapter of American Outlaws, a national soccer fan club, it was perhaps the busiest Geno’s had ever been in its short three-year history as the Lilac City’s premier soccer bar – especially since they don’t technically open until 11. At 7:20, a line had formed around the block and 20 minutes later, the place was nearly full. Every chair in the main dining room pointed at the flat screen hanging on the wall. With each foul, corner kick and especially goal scored, the place exploded in excitement. Kids shouted. Adults groaned. At halftime, with France up 2-1 over Croatia despite possessing the ball for only about a third of the time, Lena Cooley, the club’s unofficial communications director, addressed the crowd and thanked them for rolling out of bed so early. At a back table in the main room sat George Hughbanks, his two sons, their friend and his mother. Save for George, the entire table of soccer fans and soccer players was rooting for Croatia, not because of any ties to the country, but because everyone loves an underdog. As it turned out, he was this time as well. France would eventually beat Croatia 4-2, winning its second World Cup. But for a grueling hour and a half, the sprinkling of French fans sat in delight, punctuated with agony and a sprinkling of nervousness. None of those emotions were more apparent than in the face of Daniel Gubitz, a 28-year-old wrapped in a French flag, a black beret on his head and red stripes painted on his cheeks beneath black-rimmed glasses. As he sat, his leg tapped with anxiety and his hands fidgeted. His eyes stayed transfixed on the screen. Born in Grenoble, France, and having studied in the country while a student at Whitworth University, he was in full French attitude. For breakfast, he had French toast, and to help ease the nerves, a French 75 cocktail consisting of gin, champagne, lemon juice and sugar. His wife, Hannah Gubitz, came in support, decked out in an Arsenal FC jersey. It was the first time at Geno’s for both of them, and something told them they should definitely return. Perhaps to watch a more capable American team claim a win on the world’s largest stage in 2022. “It’s great,” they said of Geno’s. Published: July 15, 2018, 6:51 p.m. Updated: July 16, 2018, 11:11 a.m.